Rarotonga is one of the most romantic island destinations for a wedding, vow re-newal or honeymoon so in 2004 when Company Director Andrea Rongokea formed Wedded Bliss it was to introduce only the best that Rarotonga offers to each one of her wedding couples. Having now delivered over 700 Wedded Bliss weddings, Andrea’s initial motivation to provide the best wedding planning service in Rarotonga is a reality. “Wedded Bliss understand that there will never be a more special and intimate day than the moment you say ‘I Do’” says Andrea, who has been blissfully married to her Cook Islands born husband since 2006 and fully appreciates and understands the pressures couples go through on their wedding day. That in touch approach has shaped the Wedded Bliss company ethos which sees Andrea and her team manage every wedding as a personal celebration having its own unique aspects, moments, and requirements. Wedded Bliss pride itself on not having the cookie cutter attitude. Their approach is to embrace the challenges and integrate all the elements of the Cook Islands with every wedding couples personal needs and wants for their special day. They are renowned and sought after for their organisation and attention to detail, extensive local knowledge, bright, happy can do nature and above all they listen to you and respond to your wedding vision. 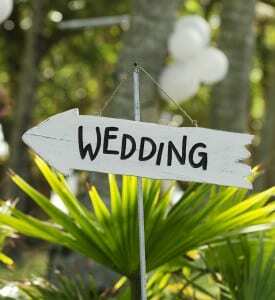 Planning a wedding can be extremely overwhelming and stressful, especially when taking place in another country. So don’t leave it to chance, let the experienced and professional team at Wedded Bliss look after all of your wedding needs. With local knowledge of Cook Islands weddings we will ensure you have the best experience to make your special day nothing but Bliss! Regardless of whether it is your first time or your last, or you are simply renewing your vows, Wedded Bliss will customise and incorporate your wishes for your big day. Wedded Bliss Rarotonga consists of 3 wonderfully skilled and talented ladies to assist in all the planning and arrangements for your once in a lifetime special occasion. 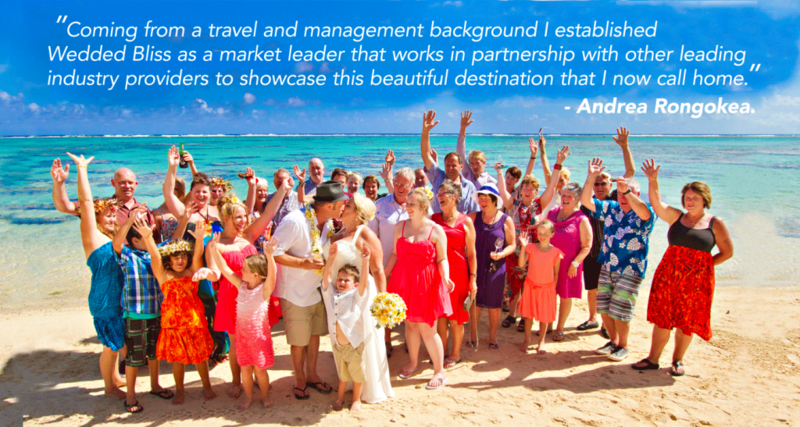 Andrea, company founder and Director is originally from New Zealand and comes from an extensive background in hospitality, public relations, travel planning, management, and coordination.. Having lived in Rarotonga since 2002 where she permanently resides, Andrea is a well known business women. Andrea has been blissfully married to her Cook Islands born husband since 2006. She is mother to three lovely children and is active within community groups. Andrea’s approach to business is to make sure everyone involved is well informed and understands the requirements or needs of her clients. Andrea’s attention to your needs is her priority and is your first point of contact co-ordinating all the answers to all your queries. She is the mastermind who works with you to ensure all plans are in place for your perfect tropical island wedding. Andrea has the ability to know which venue, location, restaurant, caterer, florist, photographer or even hen’s night experience will suit your wedding experience. Fiona has resided in the Cook Islands since 1985. Happily married she has a great sense of humour and loves the excitement that a wedding brings. A real people person, one of her favourite aspects of being a Wedded Bliss planner is getting to know the many different couples and sharing in their story. An amazing Wedding Planner extraordinaire with excellent project management and communication skills, Fiona’s local connections and knowledge will put your mind at ease and provide you with assurance that she can make your day the vision you dreamed of. From your first consultation after you arrive, through to the wedding day, and before you depart our shores, she will be with you every step of the way. Fiona’s is the warm and friendly face you will be glad to have with you to calm any of those last minute wedding nerves. Her approach is to make things happen and she instils confidence due to her calm approach to challenges. Sally was a part of the Wedded Bliss Team in Rarotonga for a little over a year before new opportunities abroad presented themselves for her and her family. Originally from the Hawkes Bay in New Zealand she is a very talented and respected makeup artist, and has been in the wedding industry for near 20 years. Now residing close to Perth in Western Australia, Sally is on hand to answer any of your questions about our Wedded Bliss weddings and about the beautiful destination of Rarotonga and the Cook Islands. She will be available for face to face or phone consultations at your convenience, please get in touch with us to make an appointment.